Years ago, I took an Air India flight to visit my family and happened to get upgraded to business class! I happen to think that the food on Air India in general is much better than any of the European & American airlines so was intrigued to see what I would get on this flight. 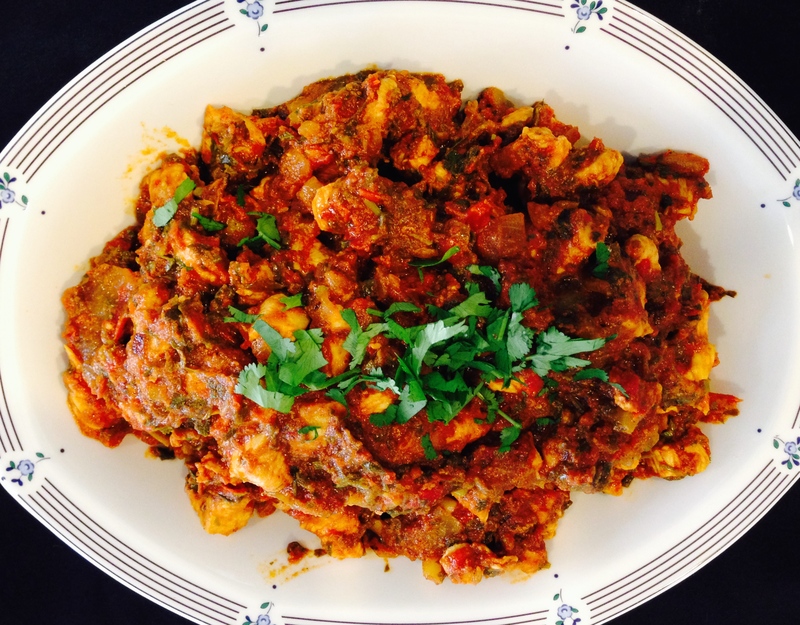 They served this amazing dish- Chicken Kothmir – and handed us the recipe as well! Since then I have adapted the recipe to make it with fewer ingredients. Because it is semi-dry, it is great to roll up in a chapati/tortilla or use as a filling in a panini/sandwich thin, and also nice as a simple dish with rice. I haven’t yet tried making this with tofu or paneer instead of chicken, but I’m sure it would make for a great vegetarian meal. Cilantro or Coriander is known by different names – the Spanish refer to it as “cilantro”. In Northern India it is known as “hare dhania”, and in the southern region it is called “kothmir”. Coriander seeds can be roasted and ground into a common spice used in Indian cooking, and also used in making “garam masala” which is a spice mix used in many Indian recipes. Heat oil in large skillet, add onions and sauté until the onions are light brown. Add the coriander powder, turmeric, cayenne pepper and stir for a minute. 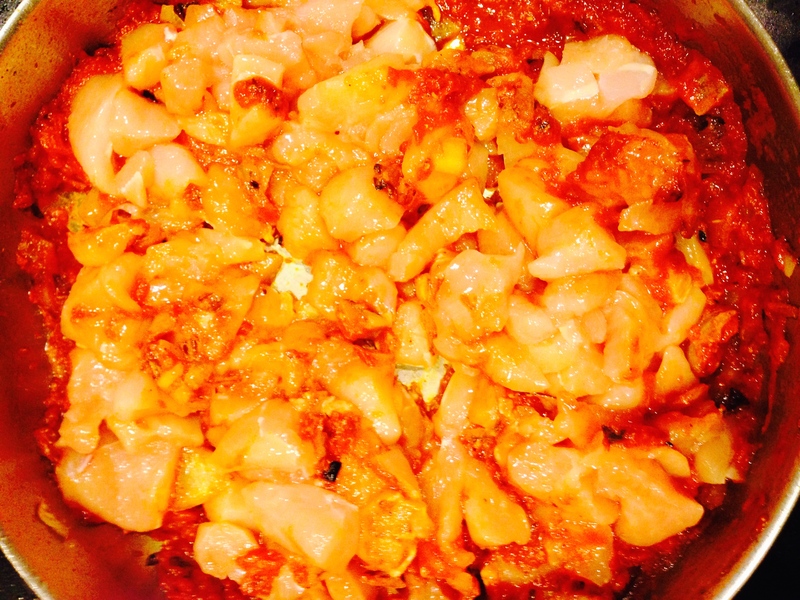 Add the tomatoes and cook for about 4 minutes. Add the chicken and salt, and simmer covered on low for about 5 minutes. 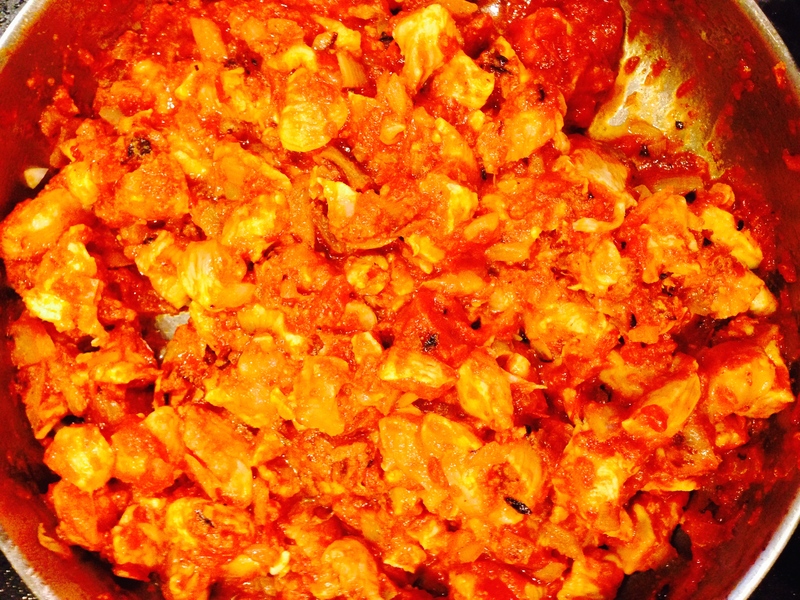 Add the garam masala and chopped coriander leaves, stir for a minute or two. Sprinkle with lemon juice.